A breakfront commode; the centre part with rounded corners eye-strikingly protrudes from the narrow sections on either side. The outside corners are rounded as well. 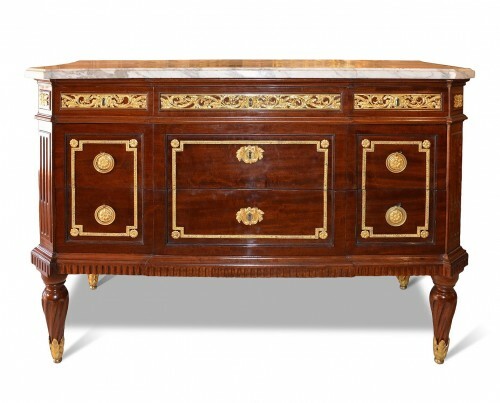 The commode has two large drawers and three smaller drawers in the frieze just below the top. 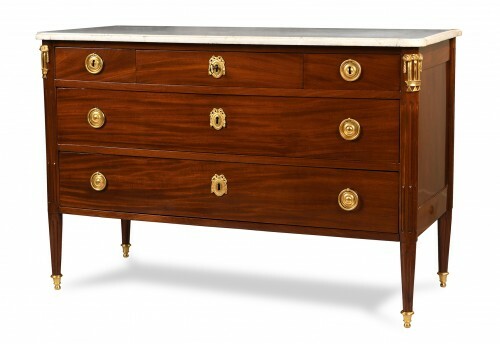 The commode rests on four tapered legs that are decorated with ebony and rosewood relief. The top is of grey marble. 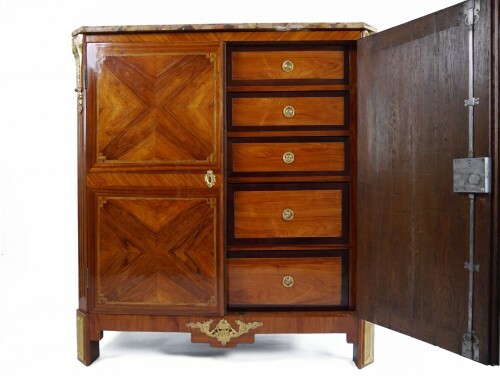 There are only few fittings applied on this piece of furniture; only the top drawers are fitted with rosette-shaped handles. 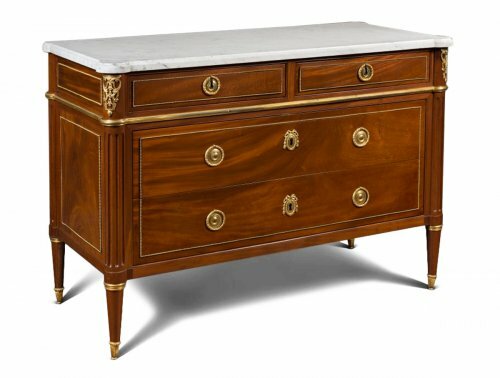 With a key that fits the keyhole in the upper of the two large drawers, all the drawers of the commode can be locked at once, due to an ingenious locking mechanism. 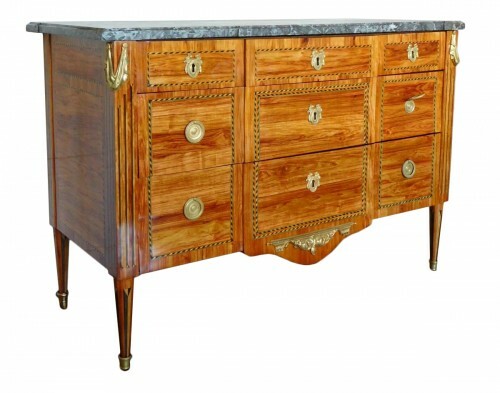 The commode is richely decorated with inlayed reliefs of wood, as well as with lacquered panels. 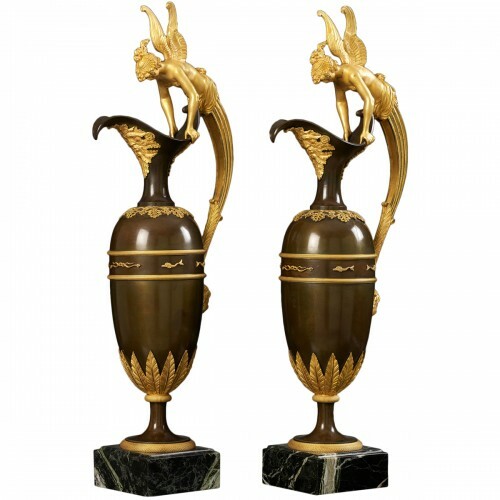 The lacquered panels on the sides and front show landscapes in gold on a black font. The outer frames of the panels on the front are the rims of the dishes that were especially made in Japan for the European market during the 18th century. 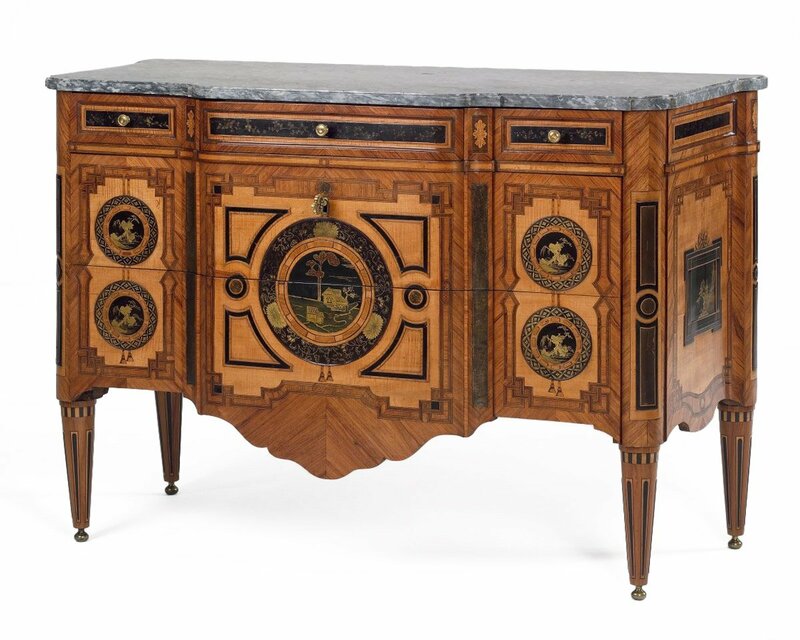 The elaborate use of a variety of materials and wood in combination with the applications of lacquered panels and a highly particular design, suggest that this commode was made in the Hague. 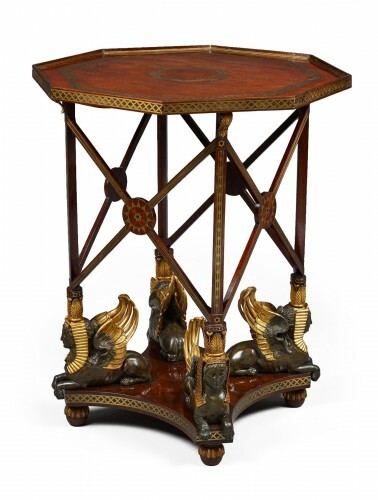 The court and the large international community provided the demand for exceptional and richly decorated furniture. The five round panels utilized in the front were originally plates and a larger dish. The rim and centerpart of the plates have been taken apart. The rims of the smaller tondos show a “cash-pattern”-motive of overlapping circles. This type of motives were very popular in Japan during the Namban-period (1550-1630). The rim of the large dish is decorated with a Karakusa-motive; a vine-like pattern of thin lines (kara means grass) and three chrysanthemums. Plates with landscapes filled with trees, houses and pavillions as well as with karakusa or cash-pattern motives were manufactured in Japan between 1700 and 1730 in fairly large amounts to accommodate the European market. 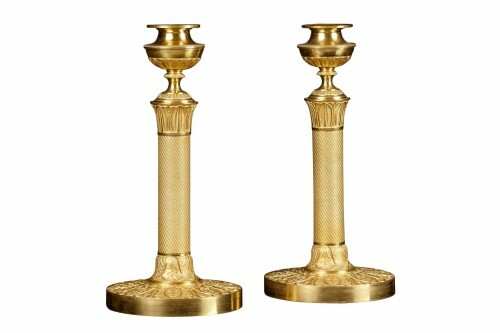 The panels in the commode stem from this period. The rectangular panels on the sides are presumably from the same period. It is not improbable that the large tondo in the centre has been repainted in the Netherlands. The fronts of the drawers in the top frieze are decorated with lacquered panes with vine-motives.